E.C.H.O. Players Society hasn't added a story. 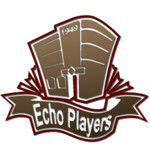 ECHO Players Society takes its name from an original theatrical group, dating back to 1934, in the communities of "Errington, Coombs, Hilliers and Others" on Vancouver Island, BC, Canada. Over time, it disbanded. Theatrical activity returned in 1975 when two individuals purchased an abandoned theatre in the area town of Qualicum Beach. They arranged for the newly formed E.C.H.O Players Society to take full ownership. Echo Players formed the ECHO Players Arts Fund to support the love of theatre,to mantain its heritage Village Theatre, to provide ongoing production needs and to support workshops, scholarships and facilities for theatrical endeavours. The mural is now being painted on marine grade panels by internationally recognized portraiture artist David Goatley inside a building. It will creatively depict themes of theatre and images of local actors from past productions. The picture above is a photo illustration of what it will look like when completed. When finished, the panels wll be assembled on the wall as part of the celebration of Canada's 150th birthday in 2017. ECHO Players Society is a total non-profit society. The Village Theatre is in use about 275 days of the year. About 8,000-10,000 annually attend its productions. Thousands of visitors annually vist the quaint oceanside village/town of Qualicum Beach. E.C.H.O. Players Society hasn't posted any updates yet. E.C.H.O. Players Society is managing the funds for this campaign. E.C.H.O. Players Society is a verified organization.